When I was a teenager growing up on a particularly weed-prone farm, the Monsanto herbicide Roundup was regarded practically as a godsend. Endless hours in the fields with a hoe were no longer necessary. But has Roundup use gone too far? The Monsanto herbicide Roundup has become the bugaboo of environmentalists everywhere. Originally marketed as a water-based spray that could kill broad-leafed weeds shortly after contact, Roundup at first seemed, at least to those of us who had to go out into fields with hoe in hand when we came home from school, as a truly wonderful technical innovation. Roundup is a combination of about 99% water, a tiny amount of a weed-killing chemical called a glyphosate, and a tiny amount of of a "wetting" agent that helps disperse the glyphospate through the solution and ensures that it sticks to plant leaves. The glyphosate is always listed on the label. The wetting agent sometimes may not be. There are at least 400 different wetting agents, each with its own environmental and health effects, although the Monsanto product usually uses an agent known as polyethoxylated tallow amines. Glyphosate interferes with the ability of plants to make the amino acids tyrosine, tryptophan, and phenylalanine. When the plant can't make these amino acids, it can't make the enzymes it needs for life, and in just a few days, it dies. 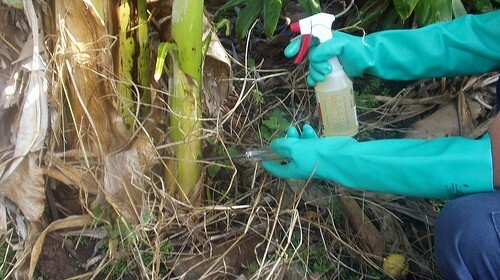 Not every kind of plant is susceptible to glyphosate. It doesn't, for instance, in the Roundup formulation, have much of an effect on trees. It is of no use at all as a pre-emergent herbicide. That is, it won't kill weeds while they are still seeds. It doesn't do any good just to spray Roundup on the ground. And since it kills all kinds of broadleaf plants and grasses, and many of our most important crops are grasses (such as all the true grains), until Monsanto got into genetic engineering, it only reduced the farmer's need to do weeding, rather than eliminating it. The people at Monsanto who do marketing aren't dummies. They recognized that farmers would line up to buy their product even back when all it could be used for was controlling weeds before crops came up (since Roundup also kills crops). And Monsanto recognized that its patents would expire in 2000, and they have. What used to be called Roundup is now sold as Accord, Aquamaster, Aquaneat, Buccaneer, Bronco, Campain, Clearout 41 Plus, Clear-up, Expedite, Fallow Master, Genesis Extra I, Glypro, Glyfos Induce, GlyStar Induce, GlyphoMax Induce, Honcho, JuryR, Landmaster, MirageR, Pondmaster, Protocol, Prosecutor, Ranger, Rascal, Rattler, Rodeo, Razor Pro, Roundup I, Roundup Pro Concentrate, Roundup WeatherMax, Roundup UltraMax, Silhouette, Touchdown IQ. The chemical is still made by Monsanto, but it is also made by Bayer, Cenex, Dow, Dupont, Platte, Riverside/Terra, Helena, and Zeneca (and this is not a complete list). But what if it were possible to spray fields even after crops have emerged from the seeds farmers plant? That would reduce the farmer's expense for tractors and fuel even more, and generate a new market for Monsanto. So Monsanto found its new market in "Roundup Ready" farm seeds. These are genetically modified plants that are able to make amino acids even if they are sprayed with Roundup. The farmer gets greater leeway on when spraying is necessary. It takes a lot less fuel to spray than it does to plow. And crop yields go higher and higher. While a corn crop of 40 bushels per acre would have been considered good when I was a teenager in the 1960's, now corn crops of 120 bushels per acre are commonplace since the introduction of Monsanto products. And that's the problem. When farmers produce more, the prices they get go down. They then have to produce still more, and since they borrow hundreds of thousands or millions of dollars every spring from their bankers, they may have absolutely no choice about which products they use. They will be told to use Roundup or find their money elsewhere. So far, all the marchers against Monsanto haven't passed the hat to take up a collection to fund farmers who want to produce their crops without the chemicals or the GMO seeds. And they haven't found the wisdom to tell the world how the system can support burgeoning populations without the tools that tripled agricultural production. They just complain about things they don't understand. Arjó G, Portero M, Piñol C, Viñas J, Matias-Guiu X, Capell T, Bartholomaeus A, Parrott W, Christou P. Plurality of opinion, scientific discourse and pseudoscience: an in depth analysis of the Séralini et al. study claiming that Roundup™ Ready corn or the herbicide Roundup™ cause cancer in rats. Transgenic Res. 2013 Apr. 22(2):255-67. doi: 10.1007/s11248-013-9692-9. Epub 2013 Feb 22. PMID: 23430588. Jasper R, Locatelli GO, Pilati C, Locatelli C. Evaluation of biochemical, hematological and oxidative parameters in mice exposed to the herbicide glyphosate-Roundup(®). Interdiscip Toxicol. 2012 Sep. 5(3):133-40. doi: 10.2478/v10102-012-0022-5.